In June, I visited my sister and brother in law in Boston for a few days, and one night for dinner, Claire informed me she was making my turkey burgers. I was confused. My turkey burgers? 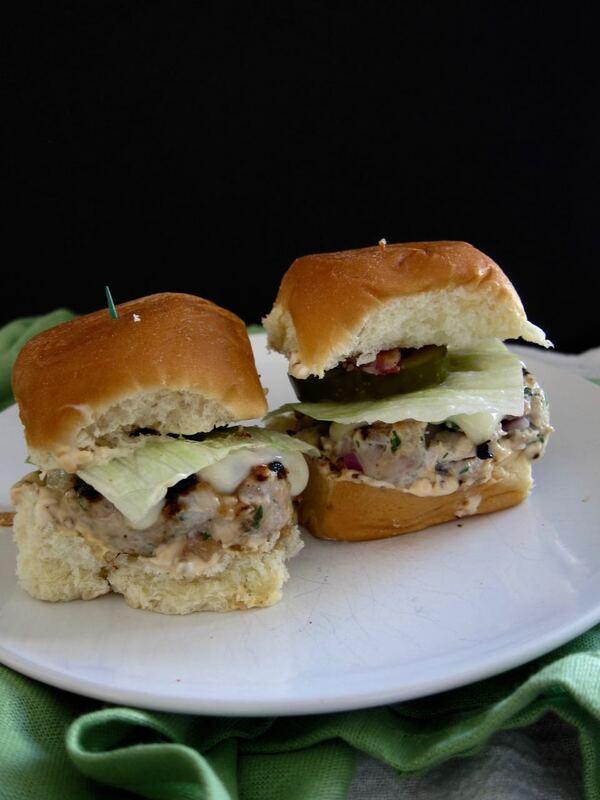 What are my turkey burgers? Ryan, trying to help me out, chimed in with "you know, Rockband burgers!" Me: "What is a Rockband burger?" Ryan: "The turkey burgers you make! You know, you made them for me and Claire and we all played Rockband and you and I became friends!" Me: "YOU'RE MAKING MY TURKEY BURGERS!" Today Ryan is one of my favorite people, a big brother stand-in I can have long chats with over too many IPAs and nag into designing logos for me, but we didn't exactly hit it off when he started dating Claire. We eventually got over ourselves though, and one day I decided to host them both for dinner at my Boston apartment. I wanted something boy-appropriate, so that meant meat, but something still easy enough and yet impressive. What to make? I had been "borrowing" discarded back issues of Martha Stewart Living from the local gym where I worked the front desk on Saturdays, and I remembered that the first issue I took home had a beautiful spread of summer burgers, and I had already cooked my way through a few of them. Burgers seemed easy but still enough of an effort that I could look like I tried, and I could serve them with tater tots out of a bag. Who doesn't get along while eating tots? I wanted Ryan to like me, so I couldn't serve him the veggie burgers made from quinoa and lentils, but for whatever reason I also didn't want to make the traditional beef burgers. I'm sure they had some fussy ratio of fat and meat that I was somehow supposed to convince the butcher at Star Market to grind for me. I opted to make the turkey burgers. They were a riff on cubano sandwiches, so there was turkey, but there was also cheese and bacon and pickles and mustard. I served the burgers (with tots! ), and then, since this was 2008, and since Rockband was a THING and I had just bought a set for my Wii, we played for hours on those plastic instruments, and it was the first time the three of us had hung out for any real length of time, and we had fun. And even better, Ryan liked the burgers so much that Claire asked for the recipe, and she still makes them for him almost 10 years later. And why not? Onion melts into the meat when you cook it and makes the patty insanely juicy, and the mustard and cilantro give it zip. 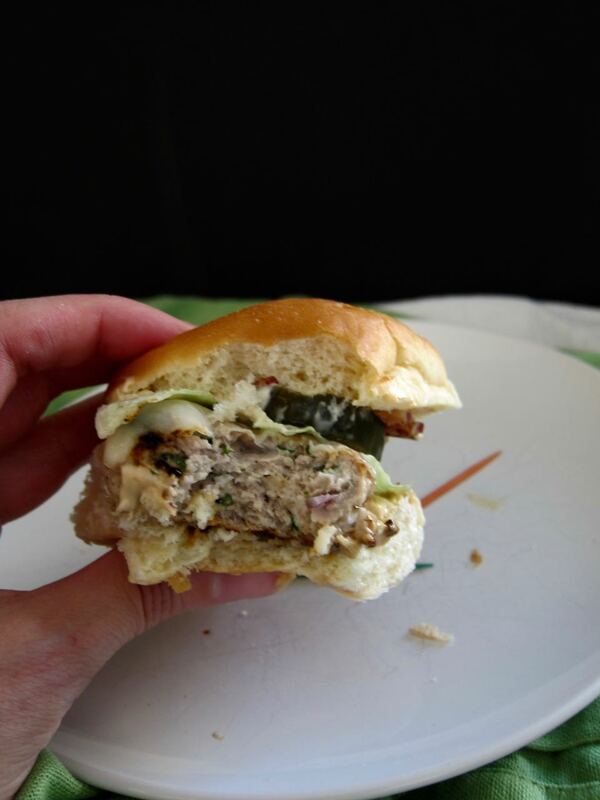 The bacon takes you from "eh, turkey" to "ooh turkey burger!" and the cheese is just never not a good idea. And apparently, in Ryan's mind, they are the Rockband burgers and now I can never not think of them that way. I had a bunch of people over on Sunday, so I took the original recipe and turned it into 24 mini burgers to feed the crowd. We didn't play Rockband, but all the burgers were gobbled up and declared amazing. So you should definitely make these, for old friends or to win over new ones. 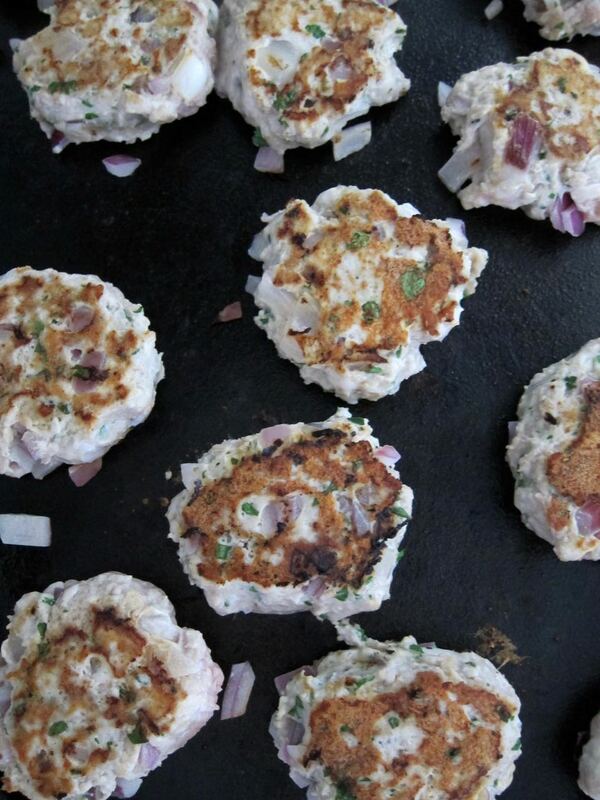 Adapted from Martha, makes 24 mini burgers. Combine turkey, onion, cilantro, dijon, salt and pepper in a mixing bowl and gently mix together with your hands until just combined. Form into 24 small patties and refrigerate, covered, for at least 30 minutes. In a small bowl, stir together mayo, sour cream and chile flakes. Cover and refrigerate until needed. Heat a griddle pan or heavy skillet over medium high heat and brush with a little oil. Cook patties, 2-3 minutes per side. Top with slices of cheese during the final minutes of cooking, or, for a crowd, melt them all at once under the broiler. Assemble burgers: spread a bit of chipotle mayo on the bottom of each bun, top with burger patties, then add bacon, lettuce, and pickles and the top buns and serve hot!